Today’s aerospace environment is incredibly complex. Like the most complex of machines, the global aerospace system is a series of interlocking gears and cogs that must be kept operating at the highest possible level of safety 24 hours a day, 7 days a week, 365 days a year, year after year. Every unexpected event causes a ripple that affects the system as a whole. People generally think about pilots when considering the aerospace environment, failing to account for the millions of men and women around the world who help keep the numerous aircraft in the sky. For every two pilots on an airline flight deck, there are about 100 people who support that particular flight operation–and the commercial airlines are only a part of a much larger aerospace environment! 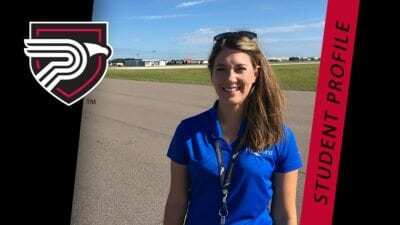 The Aerospace Administration degree program at Polk State College prepares students with this big-picture conceptual approach to the aerospace industry. Students receive a well-rounded education, not only in operational theory, but also in operational practice, using past, present, and potential-event case studies in the aerospace business field. Students enjoy both classroom and field work opportunities in this program, culminating in various administrative internship possibilities that can act to kick start an exciting, rewarding career in aerospace administration. Like all commercial (and many private) aviation operators in today’s aerospace environment, the Aerospace Program at Polk State College embraces the concept of a Safety Management System (SMS) as a quality management approach to controlling risk. Therefore, all curricula and aviation activities follow the guidance put forth in the Federal Aviation Administration Advisory Circular 120-92, “Introduction to Safety Management Systems for Air Operators,” and the International Civil Aviation Organization (ICAO) Document 9859, “Safety Management Manual (SMM).” The policies and procedures in these documents provide the organizational framework to support a sound safety culture, both for pilot training and for professional pilot operations in the National Airspace System. Students train under the same operational requirements that apply to the companies they will one day work for. After graduation from this program, individuals are not just ready for new careers in aviation—they are aviation professionals. The Polk State College Aerospace Program is fundamentally different than the traditional aviation training model. Because the entire program is based on the SMS concept, the courses, assignments, projects, and field work all have immense relevance to the workplace environment. The program further enhances this relevance by combining the curricula for Aerospace Administration and Professional Pilot Science in the core aerospace coursework. By conducting courses in this manner, students are trained in both aspects of aviation (operations and administration) to understand the systemic nature of the aerospace industry. This approach also allows students to participate in group-learning opportunities that greatly expand the overall scope and background in aviation operations.